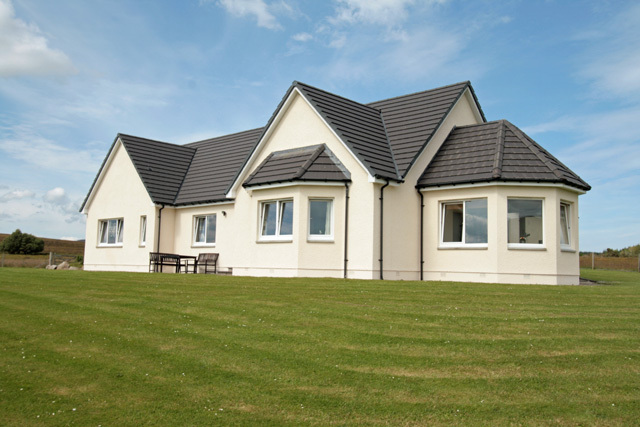 Charleston has been designed and equipped with the small group or larger family in mind, set in a stunning Highland location enjoying breathtaking views of the Monadhliath mountains and Loch Farraline making it the perfect setting for a truly memorable self catering holiday in the Highlands of Scotland. Situated in an elevated position at Errogie, in the heart of the Scottish Highlands on the south side of Loch Ness and is 16 miles from Inverness and Fort Augustus. This is one of the most beautiful areas of Scotland and Charleston is one of the best locations in Stratherrick and is only 3 miles from Loch Ness. Surrounded by hills, Lochs and birch woodlands and threaded with quiet roads, the area is ideal for the outdoor enthusiast for cycling, hill-walking, mountaineering, skiing, fishing, windsurfing or golf. 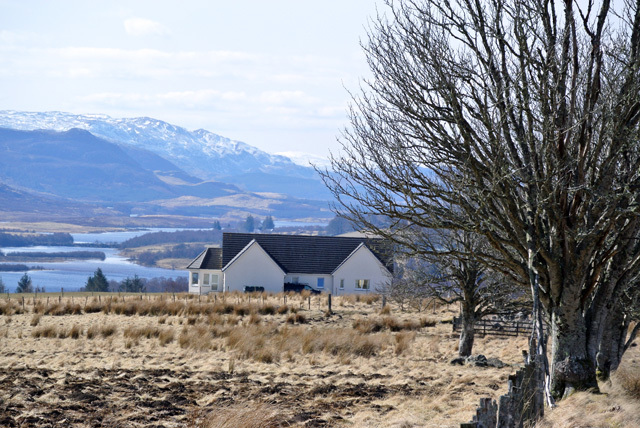 The landscape around Charleston cottage is truly spectacular, a wonderful place to experience the Scottish Highlands and just minutes from the world famous Loch Ness. 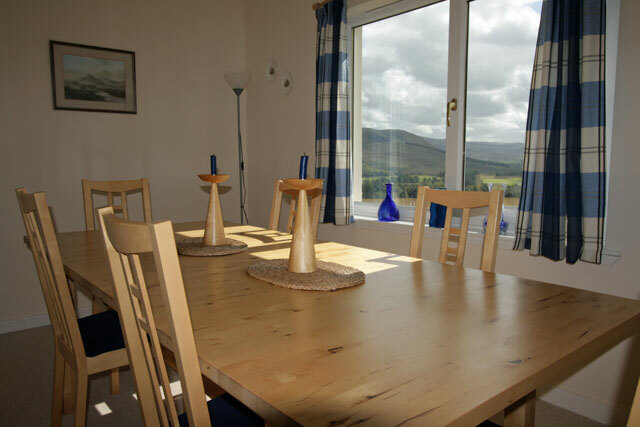 The elevated position provides guests with fantastic views through Stratherrick towards Fort Augustus and the Monadhliath mountains to the south, and equally stunning views westwards across Loch Ness and the Great Glen. A high quality, detached holiday cottage is only 3 miles from Loch Ness, and commands one of the finest views in Stratherrick. 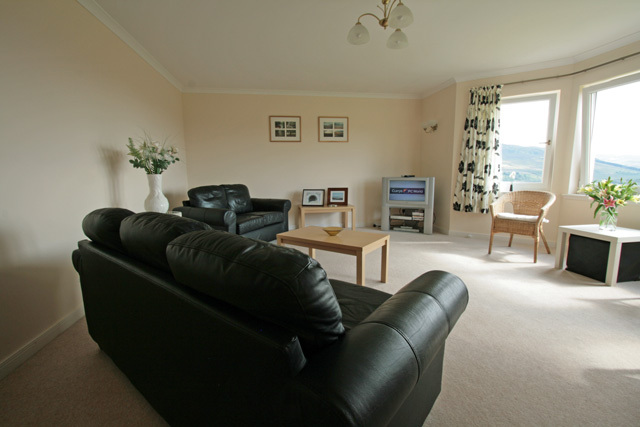 Situated in the hills, it has panoramic views over loch Farraline and beyond to the hills above Fort Augustus. 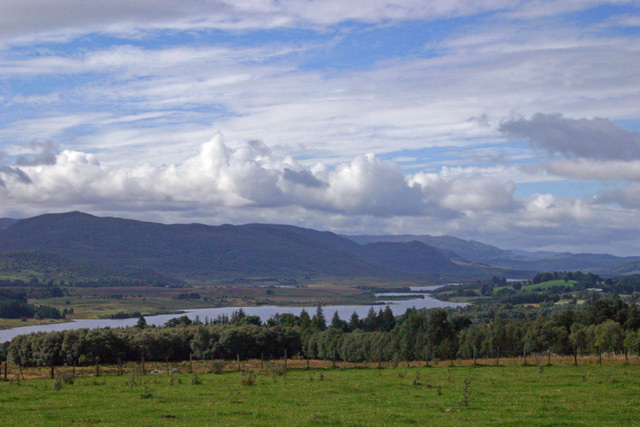 There is much to see and do in this unspoilt, sparsely populated area of Stratherrick, with much scope for forest and hill walking and numerous lochs and rivers to explore. Some rare species of birds are to be seen here such as the peregrine falcon, red kite and osprey. The Slavonian grebe may be seen on Loch Ruthven, a local RSPB reserve. Roe deer are likely to be spotted in the woodland from the windows. Red deer are more at home in the hills and excellent views of the Monadhliath mountains can be seen from the windows to the east. Red squirrels and pine martens populate the nearby Farigaig forest which stretches along south Loch Ness and covers several thousand acres. At Inverfarigaig, there is a Forestry Commission forest centre and exhibition, with waymarked trails and picnic tables. Plenty of free lochside and riverbank fishing is available in the area. Permits are obtainable locally for stocked lochs and boat fishing. Large kitchen includes - electric cooker, dishwasher, microwave. fridge/freezer. Breakfast bar. Telephone (honesty box). Utility room with washing machine, tumble dryer. 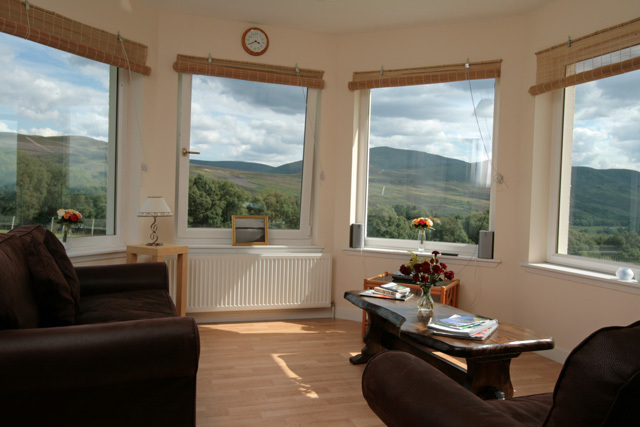 Conservatory with stunning views over the hills towards to Fort William. Lounge includes - Satellite TV DVD Hi-Fi. WiFi. Two king size bedrooms with en-suite shower rooms. Fishing can be arranged nearby. Three pets welcome. Dogs must be kept on a lead outside of the garden area as sheep may be grazing in the adjoining fields. Private high quality accommodation in a secluded setting but not isolated. Panoramic views overlooking Loch Farraline. Walks in quiet woodland and on the open hills. 2nd visit to this beautiful house was just as enjoyable as the first. Comfy and cosy, beautiful views, lovely welcome pack from the owners was much appreciated. Have used Wilderness cottages for our last 6 holidays in Scotland, and they are by far the best! fantastic holiday cottage great view from every window very clean and warm. Excellent cottage, lovely views. Quiet with lots of wildlife. Will book again. Once again a memorable stay at Charleston. Beautiful space and accommodation. Always a quiet corner to relax in with those fantastic views that you never tire of! Watch out for the herd of deer in the evenings and the resident hare. Always nice to have a chat with the cows or sheep in surrounding fields! I am afraid we cannot fault it hence our fifth visit. A wonderful cottage for families, the views are amazing and it is very peaceful. We can highly recommend Charleston as a perfect home from home in the Highlands. Set in a delightful location, away from traffic noise, hustle and bustle. The silence is just wonderful. You could spend a whole day in the garden just watching the birds and wildlife, and the changing light on the mountains. To be able to look out of the windows and see Loch Mhor down the valley, with the clouds rising off the mountains was a privilege. 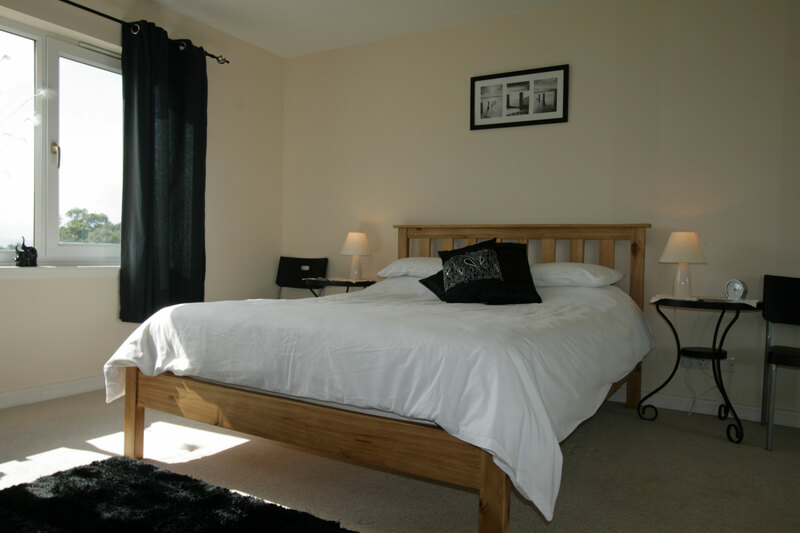 The bungalow is extremely well appointed, with everything you will need for your stay. We spent two weeks here and were blessed with glorious sunny weather. Only a half hours drive down a lovely road, with spectacular views over Loch Ness, gets you to Inverness for shopping etc. Definitely love to return. A lovely cottage to stay in and the views are amazing. The house was well equipped with everything you would need. The dogs loved the garden. Received a lovely welcome basket. Will be sure to return again soon. This is a lovely property in excellent condition. It is also good value but a few replacements such as the toaster needs to be made to maintain it's luxury status. Overall it is a property we would like to return to in the future. Absolutely stunning house and views, felt like paradise all week, the decor was lovely, all the little extras, books, cd"s, little boxes of bath items and everything you would have in your own home and more, I'm going back as soon as I can best holiday we have had in years, waking up to stunning views, wildlife and seeing birds of prey daily, a photographers heaven. Unfortunately I was unable to go on my much anticipated holiday as I was in hospital. However my brother his partner and Bertie the dog had a wonderful time. They told me that the cottage was amazing, especially the garden room where they spent many hours watching the wild life and enjoying the views. Bertie had a wonderful time with all the space to run in and explore. They said that everything you could think of was provided, the peace and quiet and the outlook were perfect. I'm so upset that I couldn't go, but we hope to go again next year. Thank you so much to the owners for allowing us the use of their property. OMG... what an amazing cottage! Home from home with stunning views. Spotlessly clean and well kept garden. The dogs (and cat) loved being outside, plenty of room for the two Labs and 5 adults. Loved the remoteness with the closest shop being in Fort Augustus, about half hour drive away, very peaceful just watching out for the birds of prey and the deer! :-) Couldn't have been more relaxed if we tried! 100% will recommend this cottage to family and friends. Hope to go back again ourselves! Excellent property, very well equipped. Felt at home immediately, lovely warm and relaxed feeling to the house. Garden excellent for our 2 dogs. Everything lovely and clean and the welcome basket, flowers and all the little extras a wonderful touch. Really didn't want to leave. Charleston is a gem of a house. Central to all the main attractions we wanted to,see in the highlands! Wilderness cottages excel at what they do and are on hand to make sure that your holiday goes without a hitch. We would recommend. Lack of wifi advertised caused a few problems though. We stayed at Charleston for our 2nd time for a week beginning 06/10/12, and what can I say that hasn't already been said, an absolutely fabulous place clean, fresh, wonderful big garden that the dogs both loved, wonderful views, breathtaking position. Have just had our third visit to Charleston and had a great time. House is wonderful with fantastic views and very well equipped. The owners are very helpful and the place spotless. Such a pleasure to stay there and looking forward to more visits. We had a lovely time at this cottage. We had great weather most of the time and the view down over the loch was fantastic. We (Chris and myself, and our three labs Wispa, Ben and Bonnie) felt at home in no time. A five star cottage definitely. My husband and I have just returned from a weeks holiday in Charleston a property in Errogie approx 18 miles from Inverness it was our 4th visit and wont be our last a beautiful property in an wonderful setting. The peace tranquility and views cannot be rivaled. May 28th- 4th June. Had a great holiday. Charleston was very spacious, welcoming, well equipped and with added extras. Lovely views and walks around the area. The girls enjoyed flying their kites and it was a fantastic place for dogs - especially letting them out in the morning within the enclosed garden area. Would definitely visit again. My husband and I had a wonderful week in this well equipped cottage. The views were spectacular and the garden ideal for our two lively Welsh Springers. We explored a good deal of the northern highlands but would particularly recommend the coastal trip around Wester Ross and the short local drive to Loch Killan. 'Local' pub/restaurant ~5-7 miles away so do your main shopping before you arrive! The cottage provides an excellent base for exploring the Highlands; whether Gorge Walking at Rothiemurcus, White Water Rafting at Invergarry, the hills around Loch Ness or the peace and quiet of Stratherrick. Superbly well appointed, this is truly a home from home. The views are outstanding, the quiet is deafining and the wild-life is right on your doorstep. An excellent time was had by all - from 2 to 49 (ish) this place has something for everyone. Had another lovely fortnight at Charleston. Such a peaceful, well equipped holiday home with lots of extras.Our granddaughter had the time of her life as it was safe for her to play outside quite safely and the house is so spacious. She even slept in her own room and was so proud to have her own bathroom!Apart from a few teething problems with the dishwasher (which the owner dealt with promptly) we had a great time and would recommend the place. This was a fantastic place and even after 4 years from our previous visit still high quality - well worth the visit which everything you could wish for. Extremely clean and comfortable. Stayed for the weekend and it wasnt long enough ! 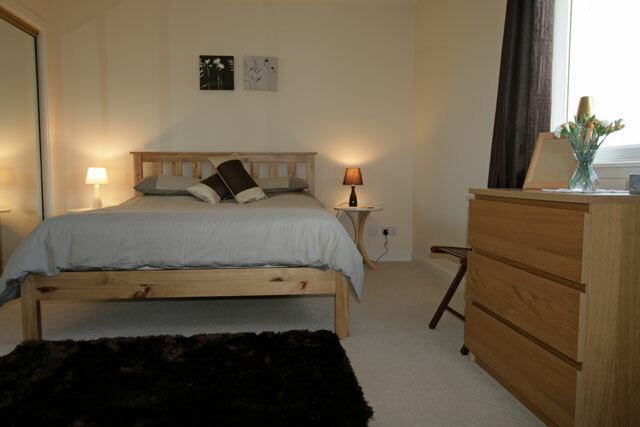 The house is in a beautiful position and is decorated and furnished to a very high standard. 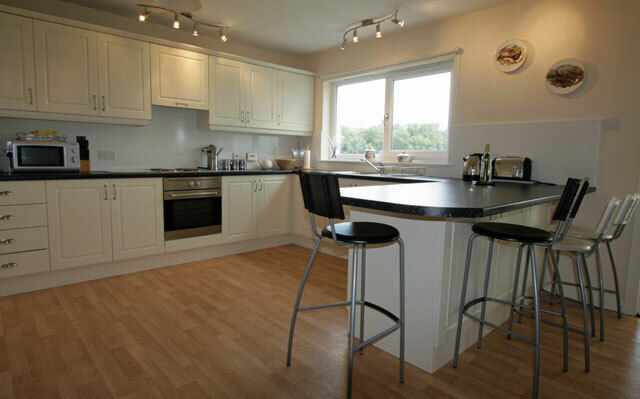 It is very homely with all you need for a relaxing break with views to die for. Will be reccomending it to others and will hopefully be back to visit soon. What a wonderful week in the deep snow. We have stayed at this cottage at least 6 times - it is perfect for groups as there is room for everyone to have their own space. The view is beautiful. Many thanks to Donny, the neighbour who towed our two cars up the long drive or we would have been snowed out. Thanks also to Corinne for her help and the cottage owner who came out with the snow plough to dig us out! We have stayed in a number of cottages now, but this one is the best.